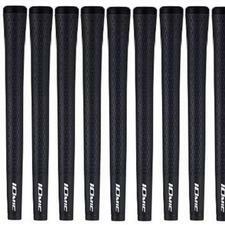 Iomic Sticky Jumbo (Black) Golf Grips- (Set of 13 Golf Grips) - $139.95 - GolfersEdgeOnline.com - Best Golf Equipment On The Web! The Sticky Jumbo is the largest size available in our popular Sticky series. This revolutionary product will ease tension in grip strength, and is also eco-friendly. The grip is made from two layers of materials, a firm inner core that minimizes torque (made from recycled IOMIC grips), and a soft surface layer made with new IOMAX material for increased comfort. If you have any more questions about the Iomic Sticky Jumbo (Black) Golf Grips- (Set of 13 Golf Grips); do not see the model you are looking for; need custom options; or prefer to not purchase online, then please call us at (630) 656-1291.